In “Face of Winter,” this season’s brand-new Warren Miller Entertainment production, you can watch Breckenridge-based snowboarder Brennan Metzler dropping off Chilean peaks like some sort of cosmic surfer carving a fresh face on the moon. As a worldwide teacher, powder poet and member of the American Association of Snowboard Instructors (AASI) National Team, it’s the latest step in his plan to share the worldwide stoke of riding. Here, he talks about the international language of winter, his top three Colorado highlights and why you—yes you!—should take a lesson. How did a kid from Snow Creek, Missouri, end up on the AASI Snowboard National Team and living in Breckenridge, Colorado? Great question. The ’94 Winter Olympic Downhill is to blame. I saw the competitors charging down the slopes and knew I had to ski. It was the coolest thing I had ever seen. A series of family ski trips to Colorado confirmed this, and, upon finishing school, I moved west. Once I was in the mountains, I made the choice to instruct, because it was the only obtainable way to get paid to ride every day. Then I realized how awesome it is to share mountain experiences with people and knew I was a lifer. For folks who don’t know what the AASI Snowboard Team is, can you provide a quick overview? We are a seven-person team selected to represent, develop and promote American snowboard instruction. 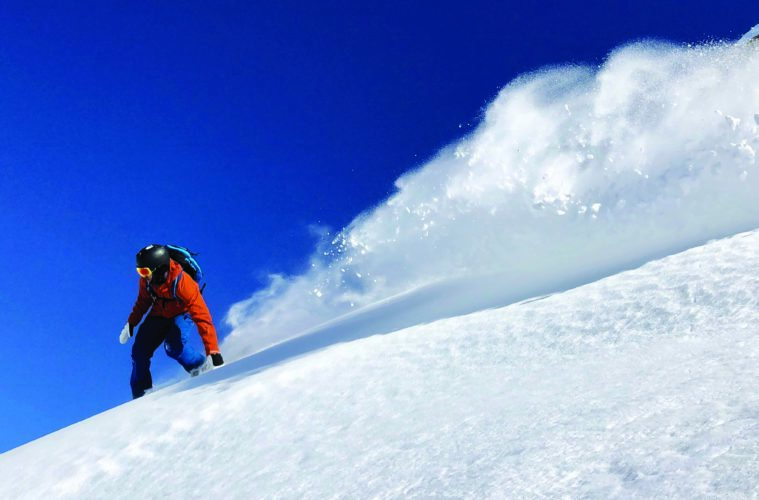 Our on-snow job is coaching and training instructors around the U.S. (and internationally). We travel from place to place, leading clinics, camps and certification clinics on all sorts of snowboard-related topics. Off the snow, we help write new technical manuals and articles, interface with various media outlets, establish national standards and practices and brainstorm on how to keep evolving as an organization. The team has been sharing your teaching tips around the world—what are some of the most amazing places you’ve visited so far? In 2015, I had the chance to attend Interski in Ushuaia, Argentina. This is a gathering of national instructional teams that happens every four years. Riding around and talking shop with international professionals at the “Fin del Mundo,” was such a wild experience. And more recently, there has been a boom of work in China—the Chinese people can’t get enough of skiing and riding. I’m looking forward to heading to Bulgaria this coming March for the next Interski. There’s a lot of talk about China committing to creating millions of new snowsports participants. What’s the riding and teaching experience like over there? I want skiing and riding to thrive in the future. Unfortunately, many of the major snowsports markets are experiencing participation stagnation or even declines. China, on the other hand, is booming. There are millions of people experiencing skiing and snowboarding for the first time, and I’m grateful to have the opportunity to contribute to that boom. It’s awesome to observe the excitement people experience when they are sliding on snow—in particular, when they achieve a new outcome or progress in their own riding. That transcends borders. In general, the Chinese sliding experience is groomer-centric, as many major resorts are limited by natural snowfall or terrain. As such, Chinese riders love carving and flatground tricks—it’s all they want to learn lately! You are featured in the new Warren Miller film “Face of Winter,” along with pro alpine instructor and big-mountain shredder Francesca Ace Pavillard-Cain. Got some highlights to share? Absolutely. Filming with Warren Miller was flat-out inspiring. Conditions lined up for us to get into some pretty awesome zones in the highest part of the Andes, surrounded by 5,000- to 6,000-meter peaks. Dropping into untracked faces, chutes and spines is what I dream about as a freerider. So yeah, getting to do that with a ripping skier like Fran for 10 days was incredible. On another note, capturing quality videos and photos of skiing and snowboarding on the other side of the world takes a team—and we had an amazing one. It was a highlight to work with such talented and professional filmers, guides, pilots and staff. Everyone was super excited to be on snow in August. I’m still on Cloud Nine. A lot of people think lessons are just for beginners, why would you recommend them for experts as well? My personal narrative is that I’ve snowboarded over 2,000 days in the past decade. And, I’m still as in love with the sport as I was on day one. A huge piece to that continued love is the perpetual potential for progression. I’m always tinkering with new ways to move over the board, and how to take existing movements to new places. With skill and learning comes freedom. The mountain rewards those pushing themselves. So yes, while it’s important to set a solid fundamental foundation by taking lessons as a beginner, it’s also significant to keep pushing out to our own personal horizons as advanced and expert riders. When you take a lesson, you see the mountain in a new way. And one last question—what are your top reasons to live and shred in Colorado?